After defeating Dark Cloak in his first adventure, Master Higgins is taking a much-needed vacation. But now he seems to have lost his memory, and his wife Tina has been kidnapped by a mysterious figure. 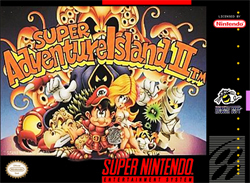 In SUPER ADVENTURE ISLAND II, it's up to you to take control of Master Higgins and help him recover his memory and locate his spouse. You'll travel through fire, ice, and other perilous places as you take on all the enemies that come your way. There are various weapons scattered throughout each island that you'll need to progress, and you'll also discover some magic bottles that will teach you powerful, and helpful, magic spells. Come to SUPER ADVENTURE ISLAND II and be the hero, Tina is counting on you!